New Year is a time to make a new beginning, a time to fill your heart with new hopes, reach out for new opportunities and celebrate the New Year. Reach out to your friends, family, beloved, acquaintances and wish them a year filled with happiness with our warm and wonderful New Year cards. Send them your wishes for happiness and prosperity and start their New Year in a very special way. 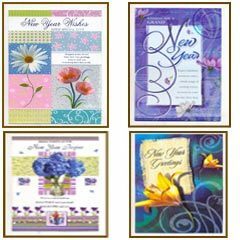 The New Year cards offered by us are widely demanded in the market due to their beautiful designs, availability in different sizes and quality prints. These are designed by our designers who are aware of the latest market requirements. We offer these cards in standard and customized options as per the requirements of our clients. Beautiful and attractive Christmas and New Year cards for corporates/companies and individuals. A must-have for the festive season! Offset printed Poster Calendars. Customized Designs Great Quality with Timely Delivery. 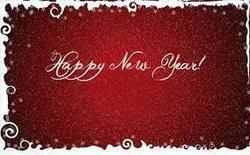 The New Year Card is a secular version of Christmas Card, of which is also historically derived. It is mostly used between non-religious persons, who have no interest to refer on Christmas nor to use Christian symbols. A focus is given to the New Year and to the wishes of 'good', 'happiness', 'health', 'contentment' or even 'success' in the forthcoming year. Lekhoni Handwritten And Handmade Christmas Cards made for niche customers. Handmade And Handwritten Happy New Year Greeting Cards. ARS Creators & Deziners Pvt. Ltd.
We are counted among the well-reputed entity for offering New Year Greeting Card. Customers can easily get them from us in varied patterns at nominal prices. In order to keep pace with the never-ending demands of customers, we are involved in offering a wide range of New Year Greeting Card.